- Protection quality not changed after lightning. -Will self activation when there is lightning. 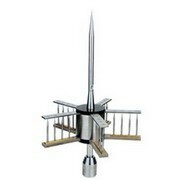 FLR-04series lightningconductors mainly absorbs and stores energy by stimulator from electric field in nature. 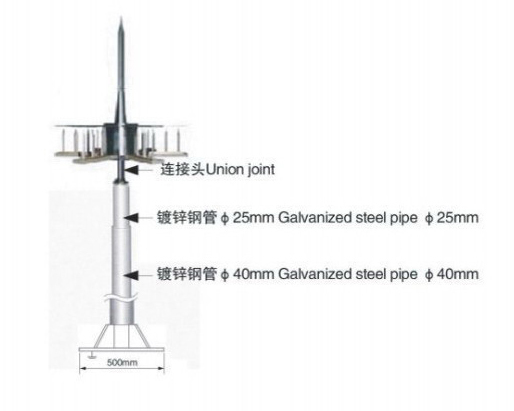 Reflector and lightning rod tip has a good electrical connection with earth, and in equipotential connection. 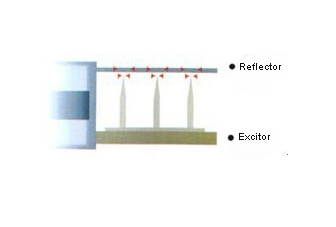 Usually, there is electric field strength betweenExcitor and reflector, when thunder occurred, the electric field strength will rapidly increase, the potential difference betweenexcitor and reflector is roughly equivalent to the potential difference of cloud and earth, and the voltage drop between them which increase quickly will cause the strike tip, and to make sophisticated the surrounding air ionization, a point discharge phenomenon. 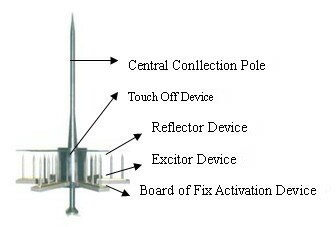 The electric field between lightning rod’s central collection andexcitor rapid increase, which cause tip of the air can be produced in a very short ionization and accurate time discharge, because of a large number of the existence of ionizing, so that naturally reduce the Corona effect, produce a expected uplink discharge passage, can quickly and safely volleys lightning discharge to the earth.